I recently hosted a webinar based on our first episode of Data Unknown, a new web series dedicated to making data more human. Data Unknown looks at how data is created, stored and protected as it has become the lifeblood of our business and social lives. During this roundtable discussion we spoke with Ian Barrett, Creative Director of MediaBoss TV, a Boston area video production company, to better understand how data shapes his business and how he approaches data storage. Rounding out the panel were INFINIDAT’s CMO, Randy Arseneau, and Marketing Director, Christie Flanagan. We started by peeling back the layers of data and how data affects us all from a personal point of view. We wake up every day in a data entrenched society. From the moment the alarm clock triggers the coffee maker to start brewing, data is driving more and more of our everyday lives. In addition, we discussed how traditional vendor videos feature customers and partners who are doing nothing more than reading the vendor’s messaging guide. Data Unknown hopes to break away from that pattern and serve as a way for the consumers and users of the data to talk about how it affects them and in some sense talk about the solutions they have found that make their everyday data missions better. Next, Ian talked about the evolution of the media business and how the data profile has changed over the course of the last 10 to15 years. He also discussed the need for perfection in the delivery of the content he creates as it is paramount to his business from both a quality standpoint and a competitive standpoint. It was impressive to learn that the MediaBoss team thinks not only about sharing the video they capture today, but also how they may need to share it in the future. That future could be a year away, or 50 years away. As a result, reliability is incredibly important in his business. Ian pointed out that “a technology mistake today could destroy you tomorrow,” stressing the need to preserve data in anticipation of future needs. Randy then talked about the ethos of INFINIDAT as a company. One main function of INFINIDAT is to abstract the data from the media and focus on the fidelity of the data ensuring it can be delivered in ways that clients need to use, store and analyze it. We discussed that one of the main objectives of INFINIDAT is to be able to give customers the ability to store more data so they can leverage it for greater business purposes. 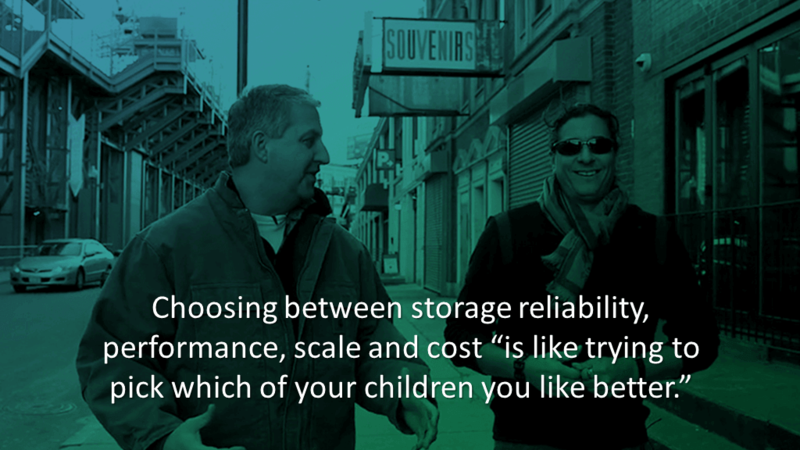 Having talked to a number of customers over the decades, there tends to be four key characteristics of a storage system that are important: reliability, performance, scale and cost. We asked Ian to rank which one was more important and like most customers, he gave us the same answer we typically get, framed in a very interesting way, “trying to pick between these is like trying to pick which of your children you like better…” This is very standard, which led us to the next question about compromise. When you are forced to choose between reliability, performance, scale and cost, usually to fit your budget, which do you compromise on? In the media and entertainment business, often scale is compromised because as you get new jobs, you can always factor into your budget / pricing getting new storage. But compromising on scale is not without risk. Randy and Ian then discussed why data fidelity is so important. As an example, when the Royal Library of Alexandria burned, it destroyed a large foundation of humanity’s knowledge that had far reaching, but unquantifiable implications because it is impossible to know what has been lost to history forever. From data comes information, knowledge and wisdom — who knows where we would be if the data stored in that ancient library was still available to process today. This brings up another notion that data today has no age, in the sense that it never gets old in terms of its potential usefulness. And if that is the case, you really can’t compromise on how your data is stored and persisted. It’s impossible to know today, exactly what data will become valuable to your business tomorrow. These days, IT is often asked, “do you have the data?” “No,” has become an unacceptable answer to that question because no one knows what even the smallest potential data loss could mean. This results in a lot of pressure on the IT organization who can no longer compromise on performance, reliability, scale or costs when it comes to data storage. If you caught it and you’re eager to see the next episode where we explore the question, “Can You Live Without Data?” — it will air later this month featuring Marc Farley. It promises to be real exciting.